Wood, Z.A., Schröder, E., Harris, J.R. and Poole, L.B. (2003). “Structure, mechanism and regulation of peroxiredoxins.”. Trends Biochem. Sci. 28: 32-40. PMID 12517450. Hofmann, B., Hecht, H.J. and Flohé, L. (2002). “Peroxiredoxins.”. Biol. Chem. 383: 347-364. PMID 12033427. Seo, M.S., Kang, S.W., Kim, K., Baines, I.C., Lee, T.H. and Rhee, S.G. (2000). “Identification of a new type of mammalian peroxiredoxin that forms an intramolecular disulfide as a reaction intermediate.”. J. Biol. Chem. 275: 20346-20354. PMID 10751410. Choi, H.J., Kang, S.W., Yang, C.H., Rhee, S.G. and Ryu, S.E. (1998). 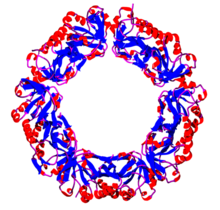 “Crystal structure of a novel human peroxidase enzyme at 2.0 Å resolution.”. Nat. Struct. Biol. 5: 400-406. PMID 9587003.